According to the census 2068, the present population of Nepal is 2,64,94,504. The population distribution of our country is also unequal. Out of total population of our country, 50% of the population is in Terai. According to the census 2068, the population growth rate is 1.35% per annum. But according to the census 2058, the population growth of Nepal was 2.25%. So, there must be a balance between the population growth and the available means and resources. The first census was taken in Nepal in 1968 BS which showed the population of Nepal to be 56,38,749 whereas in 2028 BS, the population reached 1,15,55,983 and the population of Nepal in 2058 BS reached 2,31,51,423 with the high growth rate of population. The growth of the population should be managed properly. If the population is not managed in time, then the life of humans will be in danger. The population growth should be limited up to the available means and resources of the country. Low literacy rate: - According to the census 2068, the literacy rate of Nepal is 65.9% but according to the population census of 2058, the literacy rate of Nepal was 57.4% which included the population of 6 years of age and above. The literacy rate of the male is better in comparison to female. Early marriage: - The age of marriage is also one of the factors that affect the population management of Nepal. The population of 10 years and above is taken for the study of marital status in the context of Nepal. While considering the age of marriage, the population between 15-19 years was 48.7%. Early parturition: - There is a trend of giving birth to a child soon after marriage, in the context of our country. The parents have the desire to see their grandchild after the marriage of their daughter or son. This has increased the challenged in the population management of the country. Less birth spacing: - The age space between two children in our country is found to be very less. The difference in this concept could not be brought till now. The desire of son: - Our society is male dominant society. The couple doesn't want to limit their family size until they have a son as their child. They keep on desiring for the son although they have 2-3 daughters as their child which increases the population of the country giving the challenge to the population management of the country. The concept of equality between son and daughter is found in very less couple. High infant and child mortality rate: - The infant mortality rate in Nepal is found to be high. According to the World Population Data Sheet 2011, the infant mortality rate in Nepal is 53 per thousand live births whereas of Sri Lanka and Maldives are 15 and 11 respectively. The parents desire to give birth to number of children if there is less chance of their child to be alive. While considering such situation, the problem occurs in population management of the country. Age composition of population: - According to the census 2068, out of total population of Nepal the age group between 0-14 is found to be 34.91%. This has also become one of the problems in population management of Nepal. Lack of an active role of women: - There is not that important role of women in maintaining the size of the family. Women are backward in other decision-making procesess as well. According to the census 2068, the present population of Nepal is 2,64,94,504. The population distribution of our country is also unequal. According to the census 2068, the literacy rate of Nepal is 65.9%. Our society is male dominant society. According to the World Population Data Sheet 2011, the infant mortality rate of Nepal is 53 per thousand live births. What are the problems that are seen in the population management of Nepal? The desire of son: - Our society is male dominant society. The couple doesn't want to limit their family size until they have a son as their child. They keep on desiring for the son although they have 2-3 daughters as their child which increases the population of the country giving a challenge to the population management of the country. The concept of equality between son and daughter is found in very less couple. Lack of the active role of women: -There is not an important role of women in maintaining the size of the family. Women are backward in other decision-making processes as well. Explain desire of son as one of the problems in the population management of Nepal. Our society is male dominant society. The couple doesn't want to limit their family size until they have a son as their child. They keep on desiring for the son although they have 2-3 daughters as their child which increases the population of the country giving the challenge to the population management of the country. The concept of equality between son and daughter is found in very less couple. Explain early marriage as one of the problems in the population management of Nepal. The age of marriage is also one of the factors that affect the population management of Nepal. 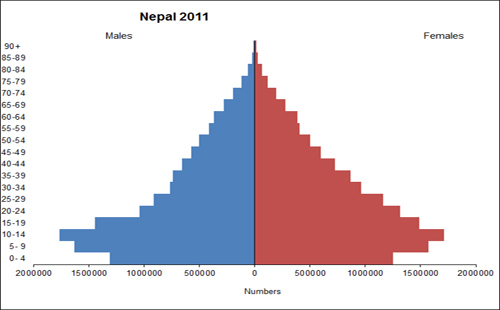 The population of 10 years and above is taken for the study of marital status in the context of Nepal. While considering the age of marriage, the population between 15-19 years was 48.7%. Explain high infant and child mortality rate as one of the problems in the population management of Nepal. The infant mortality rate of Nepal is found to be high. According to the World Population Data Sheet 2011, the infant mortality rate of Nepal is 53 per thousand live births whereas of Sri Lanka and Maldives are 15 and 11 respectively. The parents desire to give birth to number of children if there is less chance of their child to be alive. While considering such situation, the problem occurs in population management of the country. Explain low literacy rate as one of the problems in the population management of Nepal. According to the census 2068, the literacy rate of Nepal is 65.9% but according to the population census of 2058, the literacy rate of Nepal was 57.4% which included the population of 6 years of age and above. The literacy rate of the male is better in comparison to female. Which one of the following is the problem seen in the population management of Nepal? According to the census 2068, the present population of Nepal is ______. According to the census 2068, the population growth rate is ______. The first census was taken in Nepal in ______. According to the census 2068, the literacy rate of Nepal is _____. What is the major problem of population management? Any Questions on 'Problems of Population Management in Nepal '?